Aesthetically designed Cablemax enclosures are built to help solve problems associated with increased heat generation and cable management. 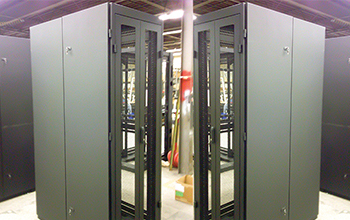 Features include use of 63 of 80% mesh opening in front and rear doors as well as removable top panel; abundant cable pass-thru holes in the frame for cross-cabling between cabinet; split doors that can save aisle space; and a split rail system with variety of dephts. In addition rails can be silk screened with individual "U" markings. 83"H x 24" W x 36" D 77" x 19"
83"H x 24" W x 42" D 77" x 19"
79.50"H x 24" W x 36" D 73.50" x 19"
79.50"H x 24" W x 42" D 73.50" x 19"